The original volumes published in 1899. Get spouses' maiden names and geographical place names in the newly updated index to The Phelps Family in America. While the original book was published with an index standard for its time, the index is largely restricted to male surnames and is of limited use to many researchers. The new index includes 250+ pages of new entries. It is available for free at Updated Index to the Phelps Family in America. Formerly available from Books on Demand for $400, our price: $199.00. Invest in your family history and order your own heirloom quality copies of these remarkable volumes. We have made an arrangement with a third party to print this family history on acid-free paper. The books you receive are archival quality, hardbound, glued reproductions of the original volumes. Generations of your family members will appreciate having these books. According to well-known Phelps Researcher Margaret Swanson, "It's a remarkable work considering that it was compiled over a hundred years ago, but it has many omissions and errors, nevertheless it is a useful 'framework' on which to hang your New England Phelps research." For example, the authors mistakenly places the original immigrants William and George Phelps' origins in Tewkesbury, England. Pages 72 to 1,257 are devoted to the descendants of William Phelps, and pages 1259 to 1557 identify some of the descendants of George Phelps. For orders outside the United States, please email us first. Special shipping costs apply. 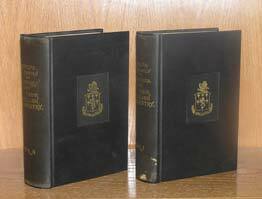 You are ordering archival quality, hardbound, glued reproductions of the original volumes. Printing and delivery takes 4-6 weeks. You will receive a confirmation email after you place your order.